1Support for marijuana legalization is rapidly outpacing opposition. A slim majority (53%) of Americans say the drug should be made legal, compared with 44% who want it to be illegal. 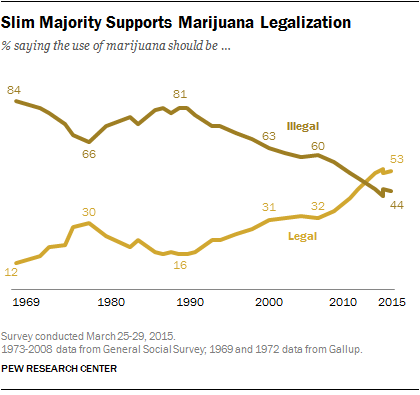 Opinions have changed drastically since 1969, when Gallup first asked the question and found that just 12% favored legalizing marijuana use. Much of the change in opinion has occurred over the past few years — support rose 11 points between 2010 and 2013 (although it has remained relatively unchanged since then). 2Not all groups support legalization. Only about four-in-ten Republicans (39%) do. While most non-Hispanic whites and blacks say marijuana should be made legal, only 40% of Hispanics share that view. 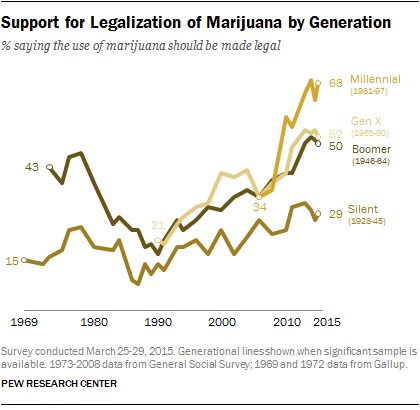 Among generations, 68% of Millennials say marijuana should be legal while only 29% of the Silent Generation (those 70 to 87) share that view. Baby Boomers, who were the most supportive generation in the 1970s before becoming opponents during the “Just Say No” 1980s, are now about as likely to favor (50%) as oppose (47%) legalization. 3About seven-in-ten (69%) Americans believe alcohol is more harmful to a person’s health than marijuana while 15% pick marijuana as worse (14% say both or neither), according to a February 2014 Pew Research survey. If marijuana became as widely available as alcohol, 63% still believe alcohol would be more harmful to society. 4While support for legalizing marijuana has grown, 62% of Americans would be bothered if people did their smoking in public even if marijuana were legal. On the other hand, 57% say they would not be bothered if a store or business selling legal marijuana opened up in their neighborhood. And just 15% say they would be bothered if people used legal marijuana in their own homes. 5Nearly half (49%) of Americans say they have tried marijuana, and 12% in the past year, which the 2012 National Survey on Drug Use and Health says is the most commonly used illicit drug in the U.S. The government survey showed that 18.9 million Americans 12 or older (7.3%) had used marijuana in the prior month. 6Four states – Colorado, Washington, Oregon and Alaska – and the District of Columbia have passed measures to legalize marijuana use, while an additional 14 states have decriminalized certain amounts of marijuana possession. 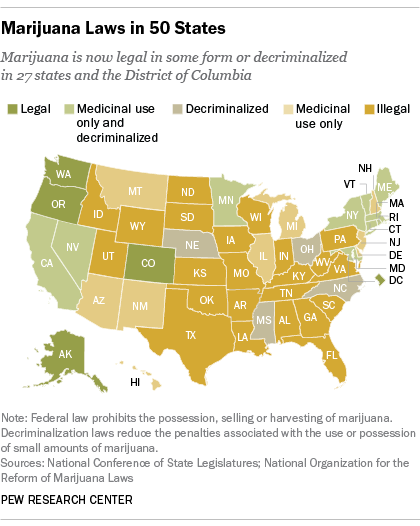 Including those five locations, nearly half of U.S. states (23 plus D.C.) allow medical marijuana. Note: An earlier version of this post was published in November 2014. It has been updated to include March 2015 survey data.